Ever since I posted the Vegetarian Hundred last week I have been thinking about cole slaw. I have a family recipe that I love, but after the first day it gets watery and the dressing doesn't really stick to the slaw. It also gets tedious shredding up all of that cabbage and grating the carrots, and I can never shred the cabbage fine enough. I mentioned in the post that I haven't made it in years. Mostly it is due to these issues. But the post got me thinking about cole slaw in problem-solving ways. The most obvious solution to the tedius cabbage shredding and carrot grating is the food processor. My father embraced this appliance immediately and applied it to anything and everything he could find. He used it vigorously, and chopped everything so fine that it was almost liquid, which is not a good way to enjoy cole slaw. But I figured I could be a little more judicious in the processing, and stop before it got to be too fine a texture. So I tried that, and I was able to stop at the right time for the cabbage and carrots to be finely grated, but not so fine that they lost their texture. The onions I chopped manually. There's not that much and it chops quickly and easily, and part of the problem in my memory of my father's attempt was that the processed onion liquified more than the cabbage and carrots, thus contributing to the problem of the watery dressing. I had two ideas to help combat the watery aspect of the dressing. First, I added less milk (I know, kind of a "duh" thing but still, sometimes it takes real thought to overcome these obstacles). Second, I did not use any salt. That seemed to solve that problem. I just added salt to the individual servings. I'm so happy with this new method of mine. And cole slaw goes well with just about anything. Quarter cabbage and remove the core. If using food processor: chop roughly and process, one quarter at a time, until you have a rough chop. Be careful not to overprocess. Place all of the cabbage into a large bowl. Cut carrots into roughly two-inch pieces and process, also to a rough chop, also being careful not to overprocess. Add to the cabbage. 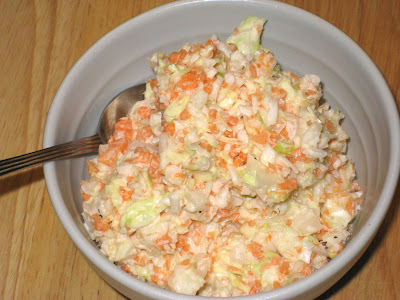 If not using food processor: cut the cole slaw into a fine shred and place in a large bowl. Grate the carrots and add them to the bowl. Add the chopped and the crushed black pepper. Combine the dressing ingredients into a two-cup measuring cup or bowl. Start with the lesser amounts and taste and adjust until you have about 1-1/2 cups of dressing. Pour over the vegetables and mix well. Can be eaten right away, but it is better after the salad has had time to absorb the flavors of the dressing. If you want salt, add it to the individual servings. Just a thing I learned -- shred your cabbage 24 hours ahead of time and let sit in frig. It helps to reduce the watery business.